Mission: To mobilize Hispanic professionals as active role models in local educational programs. Vision: To contribute to America’s future by inspiring students’ academic performance and achievement. HISPA mobilizes Hispanic professionals to eradicate one key reason why youth don’t pursue education: a lack of role models. Unless students believe they can achieve, they risk of dropping out—and indeed, Hispanic dropout is the highest of all racial/ethnic groups. This has social and economic consequences as jobs demand more education and Hispanics make up more of the workforce. Research shows that early intervention is key to reducing dropout. It also shows strong correlation between having a role model and pursuing education. HISPA programs intervene during this critical period to emphasize the importance of academics, introduce careers, and demonstrate that all students can achieve their dreams. The HISPA Role Model Program puts Hispanic professionals in Hispanic-majority school classrooms to emphasize the importance of higher education and introduce potential future careers. HISPA Youth Conferences bring 150 students to a university campus for hands-on workshops alongside positive role models to introduce college life and encourage STEM studies and careers. HISPA Corporate Visits to company headquarters allow students to explore career options immersed in a professional setting. Students tour labs and work with cutting-edge technologies and hear from company leaders. 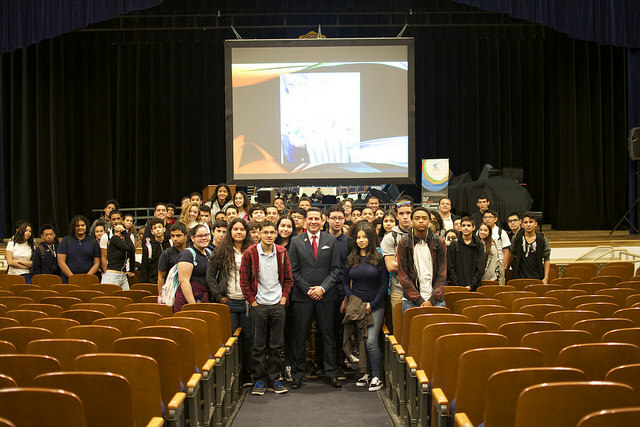 The HISPA Role Model Program: After sharing his personal, educational and professional journey at a school in his community, a HISPA Role Model takes a picture with students.